At the age of thirteen I joined the school camera club and became a passionate devotee of the darkroom and the craft of photography. By the age of fifteen my work was appearing in the Sunday magazine of The State, the largest newspaper in the state published in Columbia, the state capitol, where I lived. In those days there was usually one person in high school who had the camera with f/stops and shutter speeds and used a exposure meter. 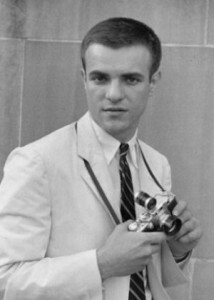 That was me: I had two Rolleiflexes and made all the pictures for the school newspaper and yearbook. Ditto at the University of South Carolina, where I was the photographer for the newspaper and yearbook. But from age thirteen I knew I wanted to be a photographer. But what kind of photographer and how would it happen was the big question. At that time I was a subscriber to Popular Photography magazine (and still am), and in one issue I saw an article about a photographer named Henri Cartier-Bresson – who was a founder of a photographic agency named Magnum. At last I had found my mentor, even though he was far away in France. And I had also found where I wanted to be, in Magnum Photos. My immediate goals were to find out what kind of camera and film Cartier-Bresson used. On Main Street there was a big camera store with a big KODAK sign outside. I went in and asked them if they had any Ilford film. “What is that?” they replied, but finally ordered some for me. Somehow I managed to purchase a Leica IIIf with a 50mm lens. The year was 1952, and I was eighteen years old. good and still are) and told him I was thinking of either being a photographer or and English literature professor. He told me he thought I should be a professor. Later in the office I met Cornell Capa, who invited me to come have a drink with him. I was still eighteen years old and had never been in a bar. He asked what I would like to have, and I replied “the same as you.” It was my first taste of Scotch, and I have been drinking it ever since. After graduation and two years of Army duty I went to New York, where I stayed in touch with Magnum and actually did some work for them when they needed a spare photographer. Fast forward to 1962, and I am in Greece making pictures for a projected book. I learn that if a stay in Greece longer than a year I will be drafted into the Greek army because I am a Greek, unless I can prove otherwise. Impossible. I decide to get into my VW Beetle and drive to Paris and visit the Magnum office. I take along a box of prints of pictures I have made in Greece. I visit the Magnum office, leave the box of prints, and drive back to Greece. About a year later, in 1963, I am in a remote village on top of a mountain on a Greek island when I receive a large envelope filled with my mail, forwarded to me by a friend in Athens. Inside is a letter from Magnum Photos informing that the annual meeting was held recently, and I am invited to become an Associate in Magnum Photos. Later I learned that they liked the pictures in the box I left in Paris – pictures that would eventually appear in my book A Greek Portfolio. Fifty years have passed since I received the letter from Athens.